The summer 2015 Youth in International Development and Foreign Affairs internship program remains open for applications until January 28, 2015. The United States International Council on Disabilities (USICD) launched its internship program in 2013. USICD’s internship program is geared for youth with disabilities from across the U.S. who are interested in careers in international development or foreign affairs. The summer 2015 internship program will bring a group of talented graduate students, recent graduates, and rising juniors and seniors with disabilities to Washington, DC, for nine weeks. This will include a one-week training and orientation program followed by an eight-week internship at an international organization in the Washington, DC, area. USICD will cover the cost of fully-accessible housing during the program, reimburse travel expenses to and from DC, and provide a limited stipend. It is anticipated that the program will run from May 24 to July 25, 2015. These dates may be subject to change. Applicants must be U.S. citizens, must identify as a person with a disability, and must be either a student or a recent graduate with either a bachelor’s degree or a graduate degree (“recent graduates” graduated between spring 2014 and spring 2015). Applications are accepted from candidates up to age 30. In limited circumstances (for example, U.S. veterans), some candidates may be eligible up to age 35. Please disseminate this announcement among students and recent graduates who may be interested. If you represent an international organization in the Washington, DC, metropolitan area interested in hosting an intern from June 1 to July 24, 2015, please communicate with internships@usicd.org. Application deadline for USICD’s summer 2015 internship program is January 28, 2015. Action Alert: Senator Harkin Needs Your Help on CRPD in October! Yesterday, September 27, Senator Harkin went onto the Senate floor to ask for a vote on ratification of the UN Convention on the Rights of Persons with Disabilities (CRPD). Unfortunately, he was opposed by Senator Mike Lee of Utah, and a vote was not taken. The Senate recesses this Friday, and will return November 12th for the final session of the year. We need your help to ensure CRPD receives a vote upon the Senate’s return! From now on, if Senators are not willing to commit to supporting the CRPD, but are not willing to state specific concerns and work to resolve them with new RUD (reservations, understandings and declarations) language, then we must count them as opposed to the treaty! The opposition continues to generate calls, and your Senators need to hear from you throughout the recess that the community supports this issue. CALL often and spread the word. Attend town halls and candidate forums. Tell them we will not wait any longer: the time is now! USICD President Marca Bristo says because of a well-funded campaign of misinformation waged by the fringe opposition, some senators do not support. Senator Tom Harkin said this afternoon from the Senate floor, “This is another sad, irresponsible day in the history of the United States Senate.” This statement came after his request for unanimous consent on the Convention on the Rights of Persons with Disabilities or Disability Treaty, was objected to by Sen. Mike Lee (R-Utah), citing disproved concerns about US sovereignty. This latest action by the right falls on the heels of the United Nations statement on September 16, that Guyana became the 150th nation to ratify the treaty. Of the 158 countries that have signed the treaty, only eight have still to ratify it. Unfortunately – and conspicuously – the United States is one of them. 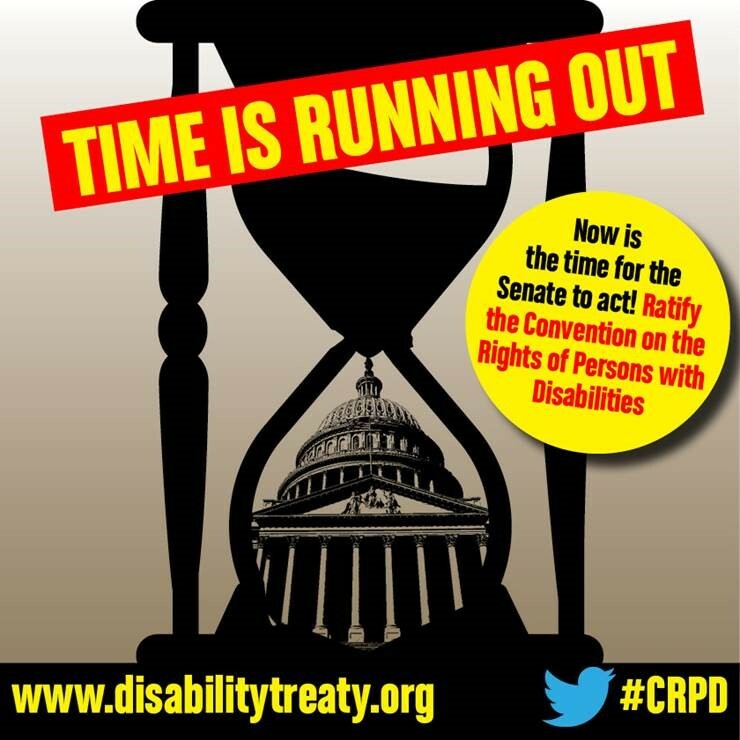 Information Alert: Senator Harkin to Ask for Unanimous Consent on the CRPD Today! We’ve just learned that Senator Harkin intends to go onto the Senate floor at approximately 12:45 p.m. Eastern today to speak on the UN Convention on the Rights of Persons with Disabilities (CRPD) and ask for a unanimous consent vote on the treaty. NCIL and the US International Council on Disabilities hope to get as many people in the gallery as possible, so please join us in supporting Senator Harkin if you are able. Gallery passes can be obtained from any Senate office. If you are not able to attend in person, we believe you should be able to watch it online. 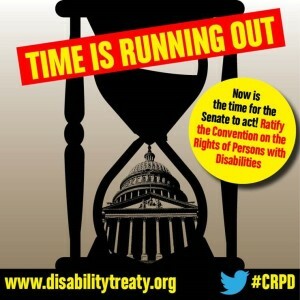 Please call your Senators now and ask them to support ratification of the CRPD. The world is watching! You are invited to an *urgent* National Disability Leadership Alliance (NDLA) Organizer’s Forum call to discuss a state-based action for the Disability Treaty, the Convention on the Rights of Persons with Disabilities (CRPD) during the August recess. Please join us to take action during this final push for September floor time! It’s now or never; people must get involved now for the CRPD to succeed! Accommodations: The call will have real-time captioning (CART). Username: forum. Password: forum. Thank you to the NDLA for sponsoring captioning. If you need additional accommodations to participate, please email the Co-Chairs using the addresses below as soon as possible.